After foolishly relying on my GPS thingy, rather than the wiser counsel of the family we were visiting, this was our first view of the entrance to New York - the Holland Tunnel. We paid $6 for the privilege of having a first hand glance at graffiti covered damaged buildings, trash strewn streets, lots of traffic and many wrong turns. The buildings tended to hinder the satellite reception, too! Apparently the state of the streets and buildings is better than it used to be! At least we were able to experience New York city without too much pain. But then we came to the part of Long Island where we are staying. This is an amazing part of New York. From what little we had seen of New York from TV and film, we did not realise that there were lovely parts of suburbia within a short distance of Manhattan. According to our GPS estimates (which assume no traffic) we would be arriving in NY by about 4:00pm. Unfortunately, being Memorial Day weekend, there was some roadwork not far after we started. We travelled 4 miles in one hour. The road was much clearer after that, but we observed NY/NJ drivers are a lot "busier" than those down South. One vehicle, containing two young ladies, happily stayed in the left hand lane (the "fast" one) obviously hopping and bopping to their music, oblivious to all the cars tailgating and swerving around them. This gave us a great example to explain to the children what tailgating was, and why not observing surrounding traffic can also be dangerous. Anyway, we finally got to the entrance to NY about 5:00pm. We arranged to meet another homeschooling family at Roadside America. With the GPS thingy we asked for a route which avoided all highways so we had a rambling trip from the hotel across all the back ways through rural PA. This is also a very green part of the country with lots of dairy farms servicing the chocolate factories of Hershey and Nestle. We saw a few Amish people and at one point were behind a buggy and cart. There is a Pennsylvania Dutch gift store next to Roadside America. I asked whether they had any Dutch Licorice. The lady looked surprised and said she had never heard of that, perhaps I was thinking about Holland Dutch. Pennsylvania Dutch is not at all related to Holland Dutch. The store has what must be one of the oldest cash registers I have seen. Not surprisingly, they only accepted cash. Roadside America is very good value. The lady guarding the entrance checked twice to make sure I had the correct number of adults and children and reminded me that children under six for free. I assured her the number was correct. The display is basically a huge train set with buttons around the outside allowing visitors to activate parts of the display. Some buttons activate a train or trolley, others will make a conveyor move or playground work. On the hour is a patriotic night time display with some Christian messages. This was well worth the time to visit. After asking and receiving much advice from other families on the 4RealLearning homeschooling forum in which we participate, we went out and bought a back pack from Walmart. It is a smaller one without the big supports which folds up nicely and is a good size so Ariel and Eric can carry Rose too. When we brought it home, Eric put it on and carried around Rose so she would get used to it. She doesn't mind, and likes to flop sideways to grin at her bearer. Cabelas has everything the hunting man might need. Guns, bows, ammunition, camouflage everything, knives, GPS units and of course, a motion activated talking deer head. Just what every home needs! If you succumb to the desire to get one yourself, here is the link online. Our friends were delayed so they suggested we meet them at Cabela's just up the road. Cabela's is a store dedicated to wildlife - and how to hunt it. Inside are displays of hundreds of stuffed animals from bears to chipmunks and about 50 varieties of deer. This wasn't just a store - it was an experience! It took a while for us to work out lots of clothing terms. Now that Lana has arisen, we just wanted to add a few more notes so far. Free refills are a great idea. Most restaurants in Australia charge for each drink, whilst most family restaurants in the US provide free refills for most drinks for dine-in patrons. So we tend to order only one or two drinks for the family and we share the cups. This saves about $8 a meal which tends to add up. The NC mum had a great personal ring tone for when her husband called. We heard the telephone sound the Lone Ranger theme and she knew her husband was on his way home to rescue her. In Virginia some use a different word for Shopping trolley/cart/buggy. The Walmart sales assistant was packing our bags and ask us "Do you want to pack your basket?" We looked around for a basket and asked for more information. She asked again and finally pointed to the shopping cart. "Aha!" we cried, "we have found a new word for the trolley!" The assistant just grimaced as these strange aliens. We have made it to Pennsylvania. 5 states now - SC, NC, VA, MD and PA. We visited Hershey World and saw an Amish horse and buggy on the way to the hotel. We hope to see more tomorrow. After briefly visiting the Shoe House, we made for Hershey's Chocolate World, Hershey, Pennsylvania. Parking was free for the first 2 hours, no entrance fees, and there was some free activities. We joined in a tour through a factory exhibit which showed the various stages in the production of Hershey's chocolate. On the wall of the rather long passage leading to the tour carriages were some TV screens with short videos showing how cocoa beans are grown and harvested. They were fascinating. Whilst we were watching, everyone went past us wondering why we would bother with something educational. We learned that Cocoa plants only grow within 20 degrees of the equator. The beans grow in pods which are harvested by hand and then fermented and dried. Very interesting stuff. The tour was also worthwhile. Visitors were placed in little two seat carriages which went through a series of displays showing each stage of manufacture. Fascinating. The most humorous part was as we were leaving and being channelled towards the Hershey Shop, a lady behind us whined, "They didn't even give us the free chocolate!" Around the next corner they did hand out a small sample chocolate bar to each participant, and this explained why everyone seemed so keen to just get through the thing. We were happy to learn how chocolate was made. In the end, Lana got her souvenir teddy bear and badge, we learned about chocolate making, and pondered about visiting the Cadbury's factory in Tasmania when we eventually return to Australia. Yummo! Just outside of York, Pennsylvania, is the Shoe House. It was built some time ago by a shoe maker to promote his trade, but now is a tourist destination offering a rest stop, tasty ice-cream and tours of the house. The icecream is home made and the price reasonable. Luckily I was able to assist Clare with her icecream. It was too tall for her, so with some jusdicious assistance, I reduced it to a more managable size! As we were planning on doing a lot more visting this trip, we invested in a Garmin iQue 3600 - a combination GPS and Palm organizer. It has proven marvellous. When we start the trip we place it in the car thingy which connects to power and a speaker. Then we pick the address from our address book and say "Route to this address". It then calculates the route and uses voice prompts warning of upcoming turns and directions. If we happen to miss a turn because either we misundertood the instruction, or were in the wrong lane, the unit announces "Off route, recalculating." The children now call it "Dad's new calculator". Is this where the government has cleverly hidden the Stargate Project? No-one will ever guess the real purpose. Passers-by will just assume it is an interesting bit oif architecture, and Australian Tourists will post photo's of it for their friends. The perfect cover! After Mass we visited the Memorial Day weekend fair in Vienna "Viva Vienna!". There were rides, stalls, displays and fine food. Ariel went the night before with our host's oldest daughter and some of her friends. One of the rides Ariel tried was this one. When James saw it today, he immediately thought of the "Skyback Riders" from Dinotopia and wanted to give it a go. Fairs are always a riot of noise, people and interesting foods. I don't know if this will be a big hit back home, but for $3.00 brave souls could have purchased 5 Oreo Cookies dipped in pancake batter and fried. Day 2 - Virginia is Green and we're not terrorists! After leaving North Carolina we went straight up the main Interstate. This is not a very exciting route, but it was the most direct. We stopped at the Virginia Information Center and found an interesting park at which we could stop. We asked the children whether they would like to stop at the park, or get to the family earlier. Unanimous - get to the family quicker. When we arrived, our host family's children were waiting at the front and started jumping up and down, "They're here!". Our children were glad to be there too! Before we could really introduce ourselves properly, the children had already met their counterparts and gone off to play. The father had expressed some concern to the mother we had been liasing with, "You don't even know these people - they're just names on the Internet. They could be terrorists or anything!" We all got along famously and are looking forward to visiting them in the future when we do a trip to Washington - not on a long weekend. Knowing that the Australian national dish is the "Barbie" (BBQ), the father cooked a variety of lovely things on the BBQ - hamburgers, hot dog sausages, salmon, mega kebabs, and (of course) shrimp. It was extremely tasty, but we had to admit that not too many Australians actually eat shrimp on the barbie (but we'll have to try it now - it was nice). We mostly have steak, chops, hamburgers, sausages (similar to Brats rather than hot dogs), chicken, kebabs and onions. The workers completing their kitchen had just left the house the evening before we arrived. We had a chance to compare Lana's new kitchen in our Australian house with theirs. Our host's kitchen was great. We had planned on visiting the Vietnam War Memorial in Charlotte, but missed the turnoff. The children preferred to play with the children at our first stop so we continued on. We visited our first family in North Carolina. We had a great time, the boys all played outside with their 11 year old son and the girls played a variety of games. Another homeschooling family was invited over and the ladies all chatted whilst nursing and fussing with babies, whilst the guys chatted about a wide range if subjects - politics, religion and whatever else I used to be told should be avoided in all polite conversations. Lana really enjoyed getting to have a chat with other homeschooling mums, who, as they also had four or more children, had very similar interests and concerns. It was a long first day (367 miles) but the GPS thingy worked great. The boys had planned on camping overnight, but came in shortly after they started. "The pond is alive!" There was so much noise from the nearby pond that the boys just couldn't get any sleep. There are times when sticky foods just make life difficult for little children. On our first day out, Rose enjoyed something stricky and smeared it all over her lips and nose. Unfortunately it remained sticky and her upper lip stuck to her nose. This should make a great photo for her 21st. This is the view from the back of the Suburban. Quite an efficient packing for a two week trek across the 15 states for 8 people in one car. Basically it is two bags for the clothes, sleeping bags and my computer stuff. Our hosts in NC had an electric fence to discourage the goats from roaming. About 10 seconds after the father arrived at home and had left the car, one of the goats was standing on the cab roof surveying his domain! Whilst playing, Peter happened to run into the fence. He commented to the father, "That electric fence feels like barbed wire!" Of course, this was said in a six year old Australian accent which tickled the dad. Obviously Peter has had experience with barbed wire fences before! When we mention that we are about to travel over 3,000 miles with six children across 15 states, the frequent reply is "You're mad! ", followed by "How do you do it?" There are a number of factors we try to take into account. The children don't care too much about museums or historical rocks, unless there is an interesting story attached. We try to ensure we see at least one interesting thing per day somewhere around lunch time. Also, we try to find interesting parks or - even better - other homeschooling families to visit. Last time, on our trip to Colorado - we saw many things and places, but the children's highlights were the families we visited. Whilst in the car we listen to a variety of audiobooks - great stories read by actors who are able to make a book come alive. We have listened to The Hobbit, The Lord of The Rings, The Narnia Series, Around the world in Eighty Days and more. Many of these come from Audible.com and others on CD from Amazon. We all participate in Travel Spotter which involves getting points for spotting various things on the way - 1 point for a new VW bug, 3 points for a Mini, 1 point for a flashing light, 2 points for a license plate (tag) we haven't counted yet and so on. We keep daily tallies. The food we eat whilst driving are normally healthy snacks with minimal food colouring. Plenty of water is available and every time we stop everyone goes to the rest rooms. Each of the children can have two or three toys only - no noise toys of course! They have some card games to play such as Uno, Boomo and so on. 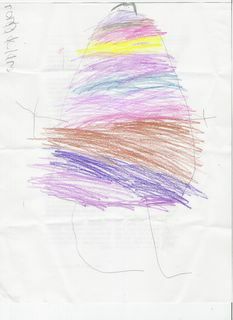 The older children have pens and paper. Books aren't encouraged whilst we are on the go because it tends to increase the chance of being car sick. Other than that, the children have learnt that if they co-operate and treat the trip as an adventure we get to see and do lots of interesting things and meet all sorts of people. We will be updating Bruggie Tales throughout the trip. 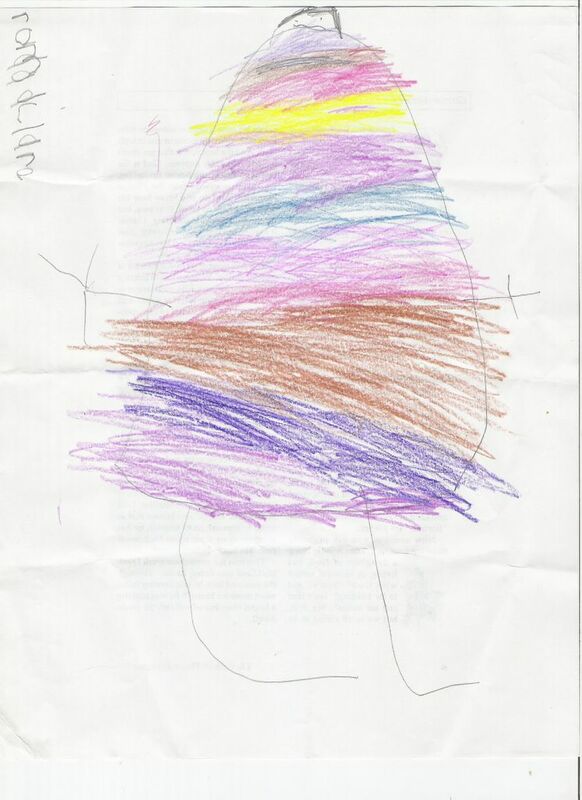 Clare (4) has decided to provide me with regular portraits of me. Here is today's. I am told that the writing (in the top left corner) says "From Clare". Note the fine proportions of head (that little thing up top), arms and hands ("wif two fingers and a fum") and legs. I reckon the body is a *little* large, but from Clare's view perhaps it's a matter of perspective? We are currently getting ready for Bruggie Trek 2005. In the space of 17 days we shall be crossing 15 States and visiting at least a dozen homeschooling families. Eight in a Suburban going on a roadtrip. We'll be updating Bruggie Tales as we go along with photos and commentary about our adventures. This food's mine, I tell you! When we were chatting on the back porch at the Southern BBQ mentioned below, Rose discovered the dog food container. We moved her and removed the sucked pellets. Yuk! Next thing we knew, she had climbed into the container and decided this was an easier way to get at the dog food! Colette and Tim ended their overseas trip with a quick visit to visit us. We picked them up from Atlanta and drove the two and a half hours home. It was a tricky dilemma for us. What could we show Colette and Tim in the short time we had together which they would never get the opportunity as normal tourists? We had it! Experience some true (fair dinkum) Southern hospitality. Friends owned a property where they ran a small farm with a cow, some goats, chickens, dogs and other bits and pieces. They had six children too and they figured it would be fun showing my city slicker family a fun time with a Southern BBQ and we could shoot some guns. Whilst we were chatting, Colette heard that the cow was going to be milked. "Can I have a go?" she asked. "Why sure." replied Angela, interested and slightly unsure what she would experience. This photo is Colette showing some fresh cow's milk on her hand. "Proof" she was really in the country. Colette did quite well at milking, persevering until she had it right. And she fed the calf from a bottle, even when the calf was pushing and pulling, not making it easy at all. Next it was the guns. Donald does a great job to ensure gun safety with hearing protection, carefully explaining what needs to be done and ensuring that no-one is anywhere near the front of the shooters. Colette did very well shooting, but here she is showing off for the camera. We each were able to fire a variety of guns, starting with a pistol or two, followed by an Assault rifle and a shotgun. Tim surprised the locals with his prowess. Targeting a hapless bit of wood, Tim hit the target three out of three. Some of the children ran inside yelling, "Mr Tim hit the target all three times!" I think Tim was pretty pleased with himself too. Donald was impressed that Tim and Colette, although having no experience with guns, did quite well. Afterwards they had me fire a new pistol he had - more power than the Magnum 44 I had trouble with last time. "OK," I said, "Just tell me what to do." Following instructions I was told the first shot was a lower charged cartridge, but the second one would have a bigger kick. He was right. The first one had a mild kick, but the second one kicked a lot. But I saw the muzzle flash, which meant I didn't flinch. Phew, I passed. Actually, Donald invited his oldest son, father and friend along to see if I would be as humourous as last time. I was under pressure to perform. My commentary last time had obviously made the rounds. After I had fired Donald's guns, the others asked me to have a go with theirs! After a beautiful BBQ, and a Pavlova (the Australian contribution to this Southern BBQ) we went home. I think this is one experience that Tim and Colette would NEVER have had as a normal tourist! We attended the graduation ceremony last night for a group of students that have completed their high school studies. Rather than stick with the boring old black hat and gown, they picked their own colours. This is the first graduation ceremony we have attended. It was held at a local Christian Church and began with a challenge address by the Youth pastor, then had a commendation by someone for a student, followed by a student response and then presentation of a certificate or diploma. It was a very enjoyable ceremony and we were privileged to be there to witness the end results of home schooling for these six young people. They all spoke well and were a little embarrassed at being in the spotlight. In Australia there is not so much ceremony surrounding the end of high school. We had some bits and pieces, but no cap and gown thing. When I finished my Bachelor of Business Accounting after six and a half years, I just said to the university "Send me the diploma - I don't care about the ceremony." After studying part time I was just glad it was over. But this was very interesting and I could see some merit in the students being made special for this time of transition. One of the mother's was crying during her speech and so was her daughter. Clare was on my lap and looking at the girl and looking extremely concerned. I had a most difficult time explaining that these were happy tears, and the girl was really overwhelmed with appreciation of the love her parents had for her. I'm not sure Clare could understand happy tears, though. Today we had an end of year picnic for all those involved in Sunday School/CCD. Parents, teachers and children all had a "pot luck" lunch (*) and then the children played various sports. Some played baseball, there was a group skipping rope, throwing footballs around (**) and so on. Eric had brought our cricket set in the car and asked if we could play. Being the excellent sportsman that I am I agreed. We just played a form of backyard cricket but I had to explain the basics. We used a rubbish bin (trash can) for a wicket. I showed the local lads how to hold a cricket bat and how to bowl - no chucking (pitching) allowed. Naturally enough, the standard batting pose was a baseball one and bowling tended towards pitching. I had a go later and all the tips my brother Philip taught me over the years (between laughs at my lack of prowess) came back. At one point, one lad said in astonishment, "You can pick where you want the ball to go?". "Sure" I said and flicked one across to him. Woo hoo! Philip would have been proud! We did get quite a few peculiar looks. One doesn't often see cricket being played in a park in the mountains of country Georgia. (*) A Pot Luck supper is one where everyone brings something for all to share. All the meals are placed on a table and everyone gets a variety to eat. (**) I don't know why it is called football. All they seem to do is throw it and then run with it. Lana catches up with news about Cross stitch on the internet and occasionally gets some great tips. We were able to try out one tonight. Rose was playing with a bag full of very tiny sead beads (used for making bracelets) when the zip lock bag opened and out flew 1000's of beads all over the carpet. After providing Rose with a plastic jar containing a handful of rice - a much better noise toy - Ariel put a stocking over the end of the vacuum cleaner hose and sucked up the beads. Once the opening was covered, she placed the bag over the end and turned off the vacuum cleaner. Voila! Beads in the bag. This was a lot easier than picking them up one by one. - sharing our lives with those we care for. It is now time to join the Blogging revolution and put Bruggie Tales in a more accessible format. This should allow us to update as events happen, rather than gather them up until the job becomes a BIG job. As I inform my clients, it is better to do the tasks during the month, so that month end is not that large hurdle. All of our original articles are now in this blog - just check out the archives sections on the left. I am just now getting some of this years adventures into the blog before we go on our 2005 American Vacation! This is the view on April 15. Winter is over and Spring is poking out. Last year we mentioned the powerful changes that occur in Spring, so this time we took a series of photos to show the change. Especially note the change in our view. We are now completely hidden from any surrounding houses. April 18 - Bits of green poking out. The drab landscape is starting to gain colour. April 22 - Whilst the other trees are ready, the oak is slowly showing some of it's leaves. April 29 - The red brown oak leaves are out showing a little green. May 10 - All leaves are now out, growing fast. May 17 - Spring is all the way here. Very green everywhere. Pollen causing hayfever. Ahhh - the joy of Spring. She has grown physically (currently 5'3") and also socially. The local Church has a piety stall staffed by various volunteers. Ariel expressed interest in assisting and on the Saturday night prior to the first Communion Mass helped many customers in their selections. That night, the lady minding the shop called the lady in charge and asked if Ariel could help her every time she was rostered on, letting one and all know the great help Ariel was. The new Narnia Movie is getting closer. The signs, so far, are good that this may be true to the novels and be in the tradition of the Lord of the Rings movies, too. Considering that Weta Workshop, the guys who created the costumes and effects for LOTR are involved, the whole thing has that epic feel. Check out the new preview. Rose always wants to help Lana in everything she does. As all the other children are learning how to touch type with Mavis Beacon Teaches Typing, Rose seems to have been paying attention. Note the well placed hands. One of my work colleagues is Russian and he would typically open a conversation with a Russian greeting. Being curious about what he was saying I went to Altavista's Babelfish website and started translating and answering in Russian. We have had a bit of fun trying to talk with literal translations. For example, saying "Cool" as in "Cool man" translated as "it is cold". Writing it is one thing. Pronouncing is another. So I discovered "Before you know it" which has a free download to learn basic phrases in lots of languages, including Russian for the Mac and Windows. I hate spyware. By going to the wrong site and answering a question wrong your machine is suddenly doing weird things like having odd web pages in your browser, or the machine constantly whirring when you are doing nothing. You have to be protected when you go surfing the Internet. 1. Firewall - all routers have a firewall, but a software one (such as ZoneAlarm - free) will let you know if programs are trying to get onto the 'net. 2. Anti-virus software - regularly updated with definitions. I use Vet but many of them do a fine job. 3. Just say "No!". If an email has an attachment, check with the sender before opening it. If a web site asks to install software, make sure. 4. Be VERY VERY careful with music download and games sites. Remember the maxim "There is no such thing as a free lunch". Many of these sites are guilty of inflicting spyware and other nasties on unsuspecting users. 5. Anti spyware tools. Every anti spyware program picks up some, but not all spyware infections. I run two: Ad-Aware and Spybot Search and Destroy. In conjunction they have cleared up any spyware I have. Regularly check your machine and get the latest file definitions. You could get a Macintosh. Yesterday we attended an end of season Soccer camping thing organised by Eric's Coach. It was at their holiday property in Coopers Creek. They created this little holiday spot from a pretty rundown and unused bit of land with some other family members and together they have created a little holiday cabin, a bathroom and shower, there is a cleaned up pond, and volley ball area and room for some camping. Some of the families camped but we only went for the day. We are very glad we didn't actually "camp" overnight. It rained almost non stop and was quite heavy all last night. This Sunday was the last class of the Sunday School/CCD/School of Religion year. Most Sundays children attend classes to learn more about the faith. I taught year 6 students this year and covered Salvation history, the underlying theme of God's love for us through the Old Testament culminating in the coming, death and resurrection of Jesus. By the year's end, the children all had a good grasp of the ten commandments, the seven sacraments and lots of big words and concepts like concupiscence, consecration, transubstantiation, and rational souls. This was a very enjoyable year sharing our Faith. Offsetting the pretty red dress and bonnet, Rose is following family tradition sucking rocks, sand and dirt. Eric attended a course to be a level 9 (Junior domestic) Soccer referee. 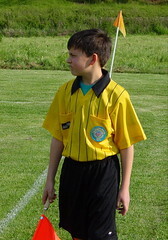 He has a refereed a couple of under 6 games by himself, but for under 8, 10 and 12 games he has been assistant referee. He takes the responsibility seriously, as you can see here at an under 10 game. His job as assistant referee is to watch for offside violations, calling side balls, goal kicks and corner kicks as well as general assistance to the centre referee.